I love being creative and absolutely love that my jewellery enables me to combine my two passions of making things and hedgehogs. All the jewellery raises funds for my hedgehog rescue work. As well as my standard designs, I love making bespoke pieces. I can make many things in different colours, sizes and shapes to create something completely unique. I’d love to show you a few of the custom silver pieces that I’ve made recently. 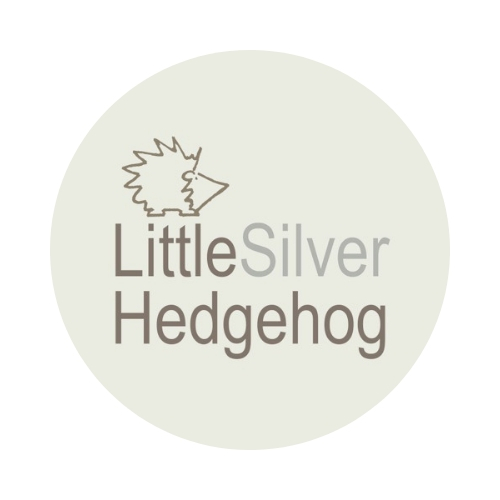 These little silver hedgehogs are my best seller. I can make them plain or patinated black to suit you. Here are some I’ve made with custom bead colours with a touch of patina. This cute hedgehog bracelet was made to a buyer’s design and can be made with different colours of handmade glass beads. It’s not all about the hedgehogs! One of my favourite designs (aside from hedgehogs of course!) are these silver birthstone pebbles. Each one is hand-formed and is completely unique. This one is set with a rare pink sapphire but I can also use other birthstones. They make lovely gifts because no two will ever be quite the same. I’ve also made custom earrings to match this design. I’ve recently ventured into hand engraving and can hand write a name or word on the back of many of my designs. I just love this engraving on the back of a cat keyring! I can also create bespoke designs to help make jewellery easier to wear. This pendant was created for an older lady who found it tricky to fasten pendants at the back. It has a front fastening loop and toggle, which also looks fabulous! Pandora bracelets are all the rage and enable you to create a bespoke silver bracelet but my charm bracelets are even more unique. All the charms are handmade by me and I can create a bespoke one just for you with lots of different charm options. Fancy something on a different type of chain or maybe even a fabric ribbon? I can create these liberty fabric bracelets in many different shades and patterns. I can also make them as pendants. I hope you’ve enjoyed this little explore through the possibilities of custom silver jewellery. Lots of people don’t realise that I can make bespoke pieces so I hope this helps spread the word. You can also get in touch here. I run a hedgehog hospital in York, England. My work is entirely self funded and my silver jewellery helps to raise funds for food, medicines and equipment. You can also support my work here. I live your jewellery Emma. The earrings I bought from you are my favourite! Your jewellery is very beautiful and very special, as your work with hedgehogs.